Mukan Resort, where yours are the only footsteps in the sand. It’s better at the beach. 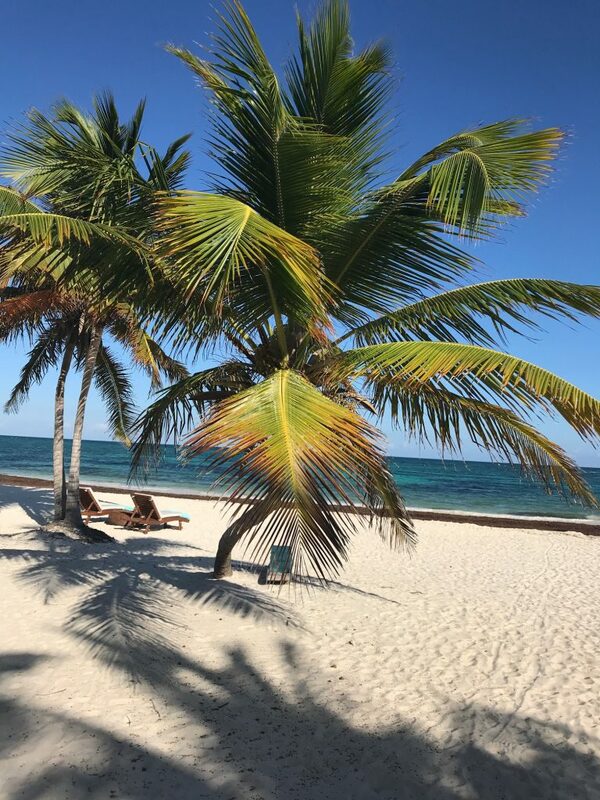 It’s the sun, the surf, the sugar white sand and yes, the beach chairs. 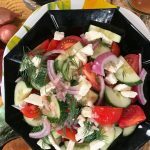 But another reason to celebrate sunny climes is because of the foods that grow in tropical places starring avocado, mango and of course the seafood splashing into so many nutritious and delicious recipes. 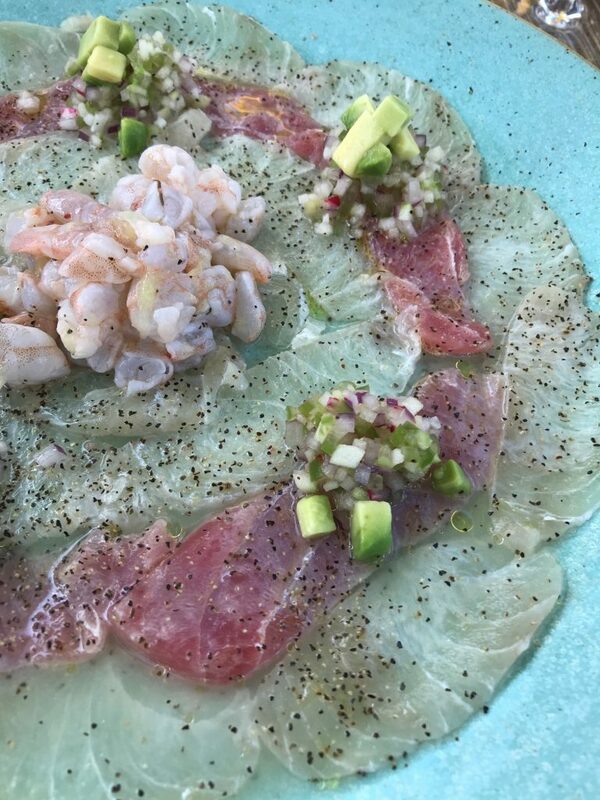 Everyday a different fresh ceviche artfully arranged for lunch at Mukan Resort. 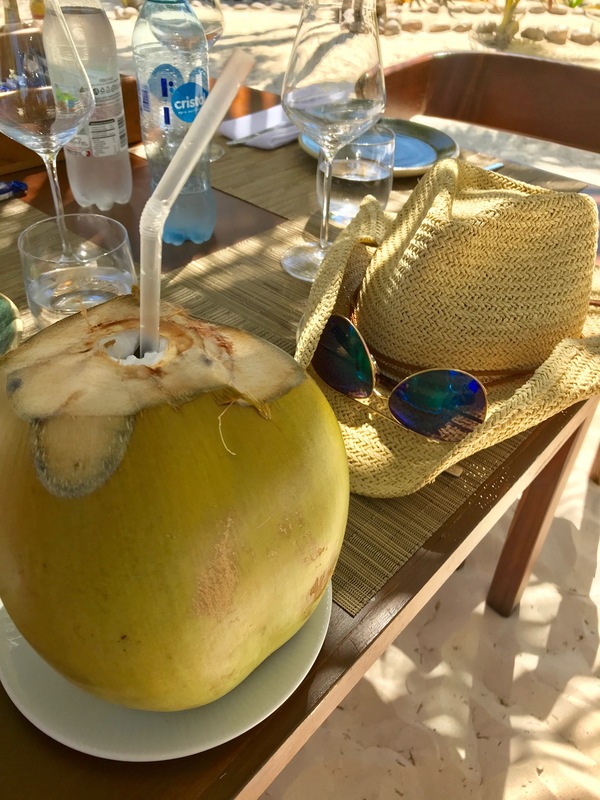 On a recent trip to Mukan Resort in South Tulum the Mexican menus were bright and light and so local that the coconuts served were cut down from trees shading the bungalows below. Mukan is a very special place located in a nature preserve. The flavors inspired me to create a TV segment for Atlanta & Company called “It’s Better at the Beach” even though the morning temperatures in Atlanta were in the brrrrr 30’s! Everyone (everywhere!) is SO ready for a beach getaway for spring break so let’s bring it! Tropic like it’s hot! 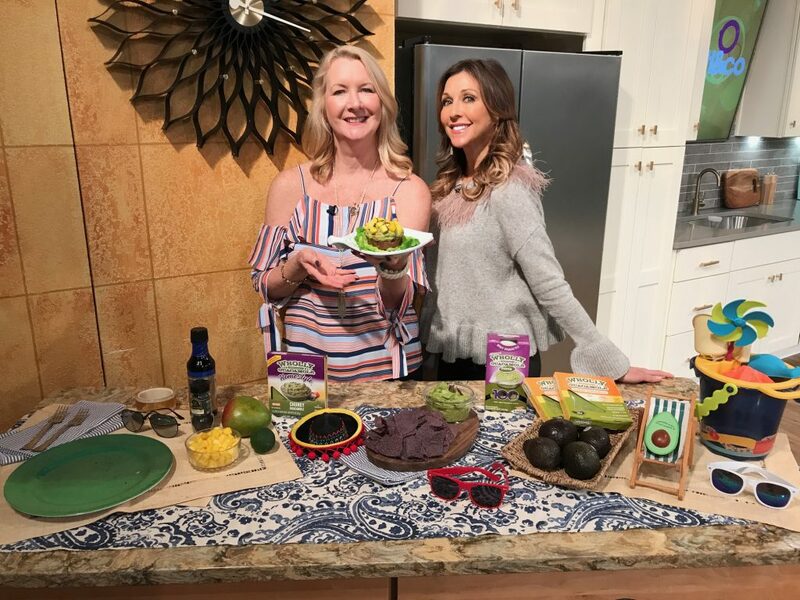 Host Christine Pullara and I serve up Mexican beach inspired menu on Atlanta & CO.
There’s no reason to stress or deal with a mess on spring break or anytime you want to enjoy the creamy, delicious taste of avocado in guacamole and so many recipes. 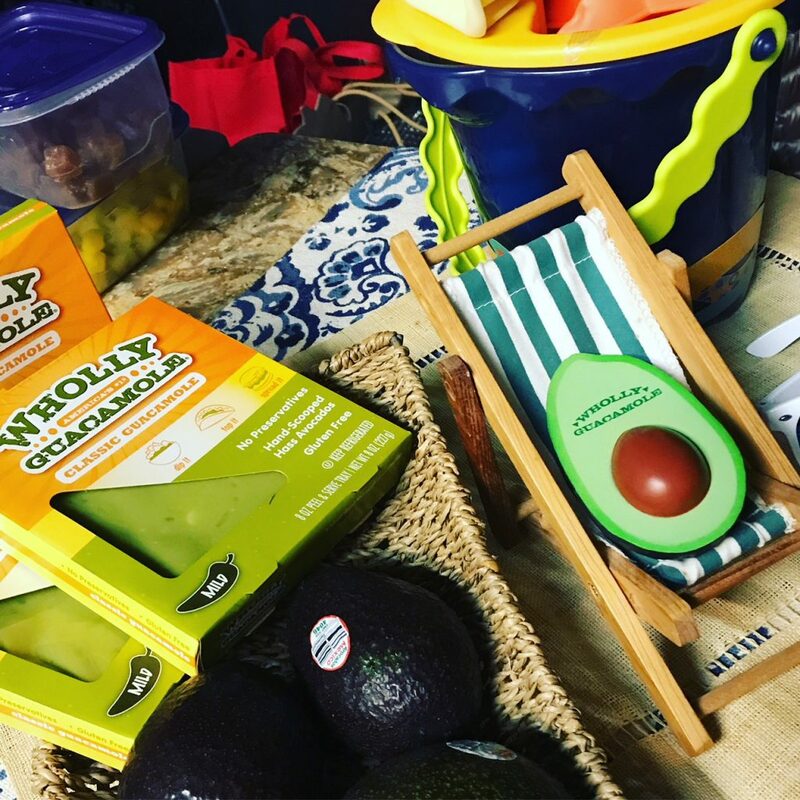 Wholly Guacamole is a terrific product that includes….drum roll….hand scooped avocados, the buttery Hass variety, from Mexico and no preservatives. I really like the Homestyle chunky guacamole with diced avocado mixed into the smooth and tasty mix of onion, jalapeño, tomato and lime. Only 50 calories per 2 Tablespoons and a great source of healthy fats, good for your heart and your skin. 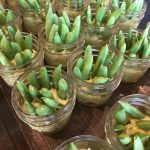 Disclosure: I worked with the good folks at Wholly Guacamole to create these recipes and they sent me the samples of …yum…guacamole. Rest easy with Wholly Guacamole hand scooped Hass avocado with no preservatives. 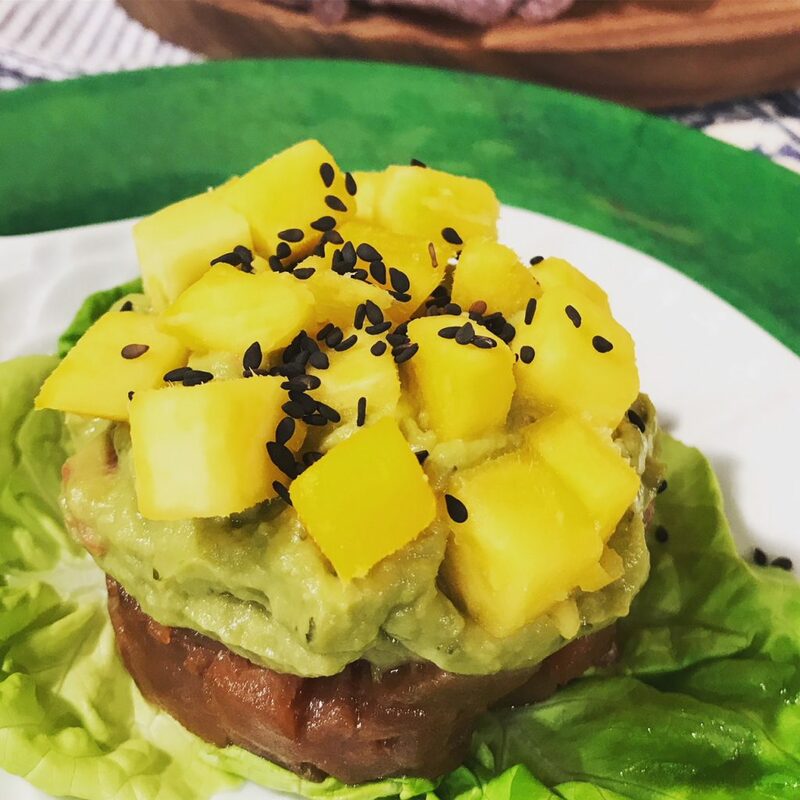 Ahi Tuna tower with chunky guacamole and diced fresh mango, topped with black sesame seeds. Simple, simple. Chop raw Ahi sushi grade tuna into a dice. Mix in a little sesame oil, tamarind sauce and lime juice. 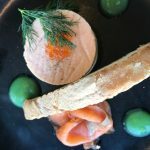 Thank you to my good friend Jackie Franklin who made this dish as an appetizer at a recent dinner party at the lake! That’s your bottom layer. Then top with chunky Wholly Guacamole and diced fresh mango. Optional: Sprinkle with black sesame seeds. Served on a bed a bib lettuce and enjoy. SWEET: NOW FOR THE MANGOS! 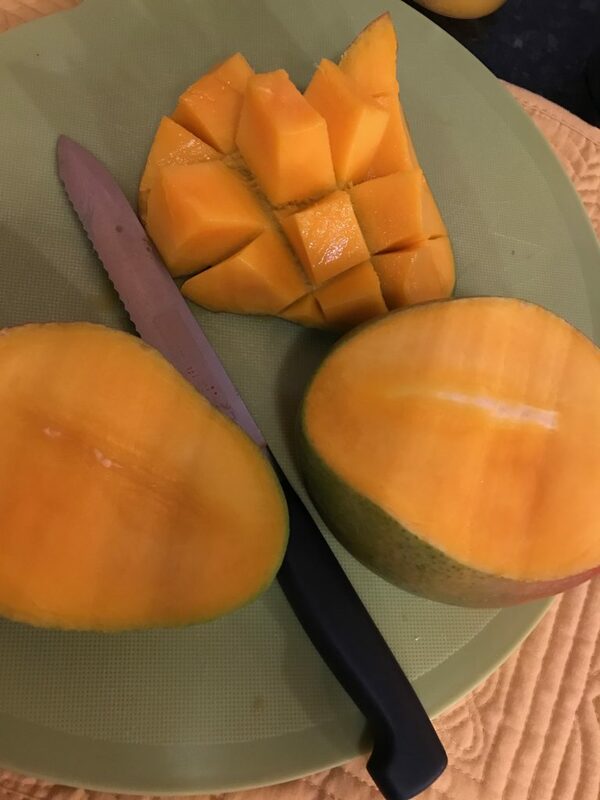 Make a cut 1/4 inch from stem top on each side to slice mango away from the long seed inside. Score and fold open to reveal delicious chunks. When are Mangos in season? That’s easy. This month and every month! 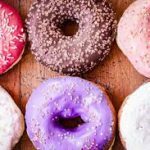 because there are six varieties that rotate into the market all year long. Mangos are a super source of vitamin C. One cup is only 100 calories and delivers 100% of the C you need for the day. Also a good source of vitamin A, fiber and folate. 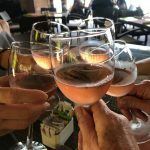 All essential for good health and beach bodies! 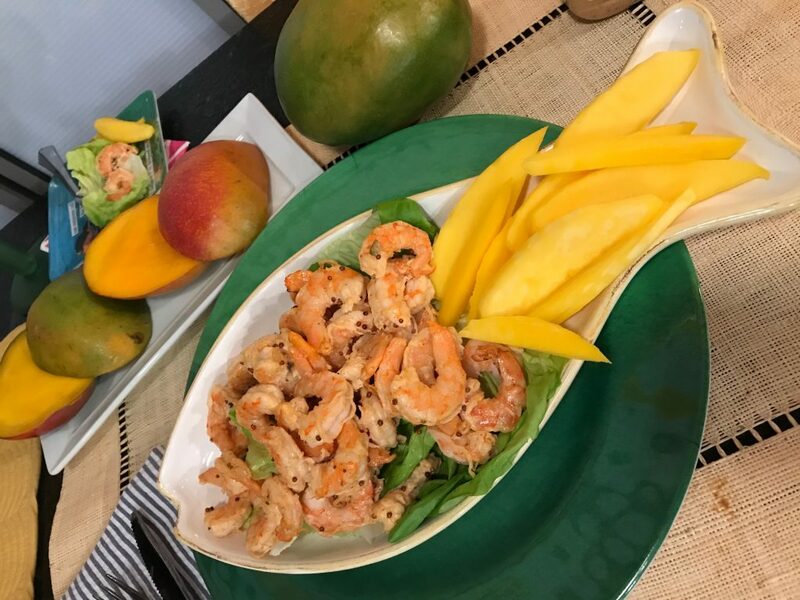 Serve fresh cut mango with savory seafood dishes such as this spicy Shrimp Remoulade Salad. Hint: frozen shrimp save time and taste great! Shopping tip: See the mangos in the photo above? Color, such as green, gold or red are not an indication of ripeness. Gently press a whole mango to feel if it’s medium soft inside so it’s ripe and ready. 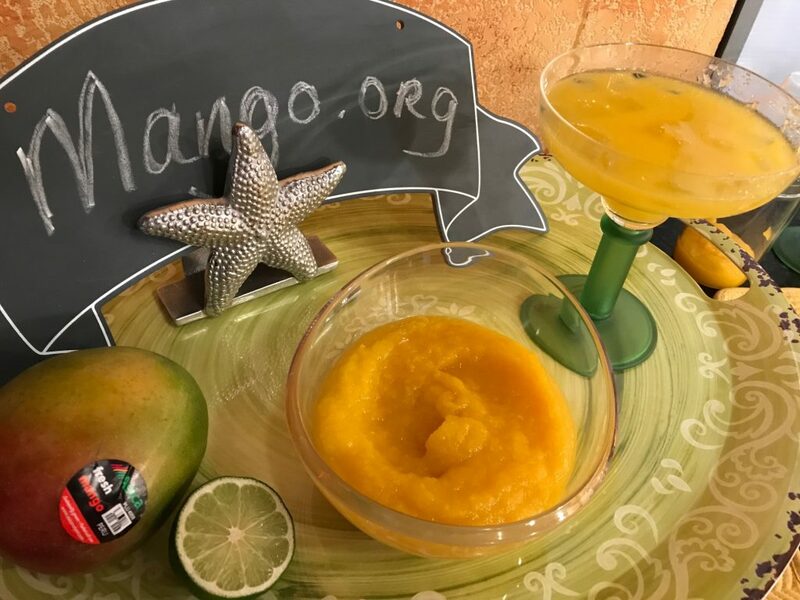 The National Mango Board has lots of tips, recipes and a video showing you how to easily slice a mango on their colorful, fun website. Disclosure: I worked with the good people at the Mango Board to create the TV segment and this blog post. Mango Margarita Anyone? Mangos are known as the super fun super fruit so that makes me feel like making a cocktail. 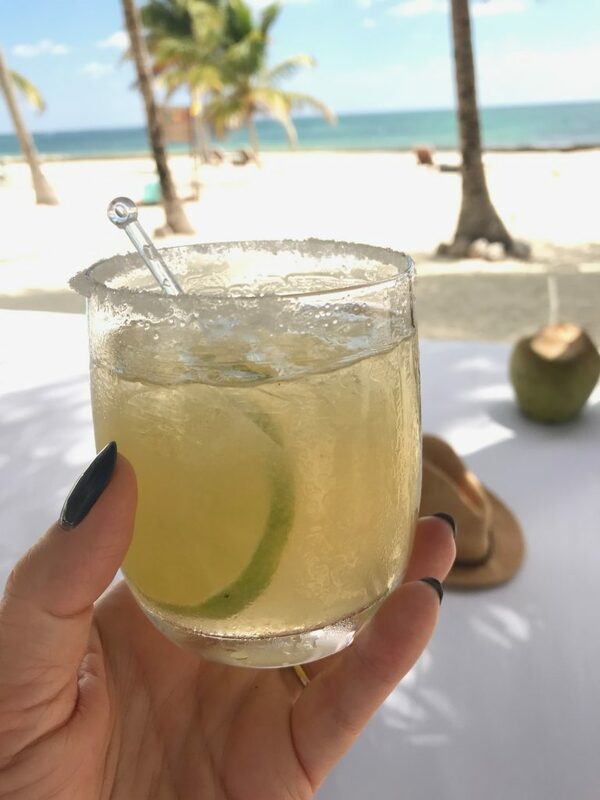 Inspired, again, by my Mukan vacation, I think a margarita is in order. At Mukan the only sound other than the birds and the waves are the friendly voices asking if you’d like a margarita. Lime? or Mango? I say Mango! Only 3 ingredients: pureed fresh mango, silver tequila and fresh lime juice. Oh, and some ice! Happy Beach Day Planning to you all! Can’t wait to go back. But until then we can all enjoy a taste of the beach with mango and avocado. 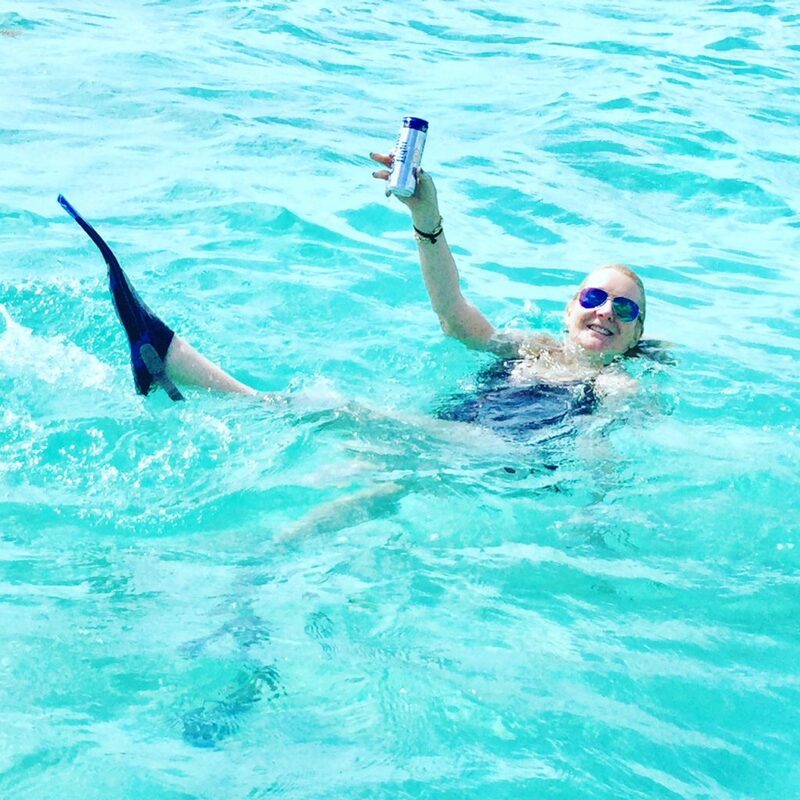 Yes, that’s a Corona Light, because it matched my flippers. Thank you to the National Mango Board and Wholly Guacamole for teaching us so much about your delicious and nutritious foods! Now that’s Happy and Healthy in the Kitchen.